In big companies, it is likely that you are working under a boss. Various companies have different kinds of bosses. Some bosses are very inspiring as opposed to that some bosses are extremely incompetent and are never able to do their own tasks well. It is for this reason that a number of times, these bosses go so far as to actually take credit for work which they have not even done. If you find that something like this is happening to you too in the workplace, here are some of the things which you can do in order to help you along the way. This is a sensitive situation, so do deal with it in a proper manner, else you might end up getting fired. 1. Is there really anything you can do? Before you think about taking strict action against your boss, you should stop for a moment and think about whether, when you joined the company you were told that you were going to work anonymously. Believe it or not many companies mention in the contract that once the work has been submitted by the employees, the work becomes the property of the company. It is for this reason that when you sit down to sign any contract you should read every clause of the contract very carefully. If you have unwittingly signed a contract like this then there is really nothing which you can do. This is a situation which is rather sensitive. So do go about dealing with it in a proper manner. If the manner in which you deal with the matter is very messy, then that is going to make things very complicated. Think about whether your boss has deliberately taken credit for your work or he has unknowingly received all the credit which is due to you. Over reacting in such a situation might end up ruining your image. In the corporate world you should deal with situations in a very tactful manner so that no one thinks of you as someone who is immature and naïve. One of the worst things you can do at such a time is, act in a rash manner. If you go storming into the boss’s room blaming him for stealing your work then you will surely be fired on the spot. In the work place there is no place for such people who are unable to take control of their feelings. Address the matter in a mature as well as professional manner. Show that you are someone who is a no nonsense person. Learn to be someone who is able to rise above petty situations. 4. To what extent do you really care about the credit? There are some people who love receiving credit and attention for every little piece of work which they do. Such people love being noticed and living in the limelight. As opposed to this there are some people who dislike being the center of attention. So when your boss takes credit for what work you have done, you should think about, how much do you really care about getting the credit. Are you someone who only works for credit and notice or are you someone who likes doing things for the sheer love for their job. 5. Along with the credit is your boss getting additional bonuses? When your boss is taking credit for work which you are doing, along with that also take notice of the fact whether he is also taking bonuses and money which is really due to you. Once you have seen that he is doing this then you should immediately make it a point to speak to the highest authority in the office. 6. How is the situation affecting your career? If your boss is taking credit for work which you are doing, you should make it a point to note down exactly how this is affecting your own career. Many a time, it is things like this which lead people to get promotions. So if your boss is taking credit which is due to you then chances are that no one is going to take notice of you and think of you as someone who is capable. Before you go to make a complaint to anyone, you should make it a point to note down exactly when and at what time he has taken credit for projects which you have worked on. Giving concrete examples is really important to help your case. 7. Is your boss compensating in some other manner? Once you know that your boss is taking credit for work and projects which you have been doing, you should ask yourself whether he has been compensating you in other ways? Has he increased your salary for all the good work which you have been submitted? Has he praised you or given you a pat on the back? If he has not done so, then there is no need for you to take all this lying down. There is some truth in the common saying that credit should be given where it is due and if you are not given the credit due to you then that is extremely wrong. You should make it a point to ask your boss in a direct and stern manner as to why he is taking credit for work which he has done. Once you do this, he will understand that you are someone who is not going to take this in a light manner. Once you show that you are meek and submissive then chances are that he will keep wronging you in this manner. In the corporate work you must be bold and stand up for exactly what it is that you believe in. If you fail to do this, then do not expect that someone else is going to come and fight your battles for you. If you take note of the fact that on several occasions the boss has taken credit for something big which you have done, then maybe rather than keeping the matter locked up in your own mind and thoughts, you should consider talking to your colleagues and asking them if something like this has happened with them also. If they too say yes it has then maybe all of you can form a group and voice your anger at this. If your boss has only been doing this with you then you could seek advice from them asking them what they would have done if they were in your place. One of the best ways to tackle such a problem when you know that your boss always takes credit for work which you have done, is actually being a very loud mouth. If you are someone who is always very vocal about any task which you are doing, then everyone will know your boss is lying when he stands up to take credit for something which you have done. This is something which is most effective indeed. People who are loud and very open usually are the ones who get into the least trouble simply because everyone knows and is aware of what is going on with them. There are many people in the business world who choose to take a rather passive approach when this happens to them. They just accept that life is unfair and do not react when the boss is taking praise for work which they have done. When asked about why they do this they simply say that they are too afraid of losing their jobs and no matter what they would never like to get on the wrong side of the boss. Getting good jobs is not easy nowadays and that’s why they think that as long as they are getting their salary they do not care about who is getting the praise for jobs which they have done. Just because someone is taking credit for work which you are doing that does not mean that you should react by giving up poor quality work the next time. This is a stupid things that many employees do in order to tackle the situation. But this is something which is both very wrong and stupid. No matter what circumstances you are made to face in your workplace you should never let it impact the quality of work which you submit. If you love your job you should ensure that you are doing justice to the position which you hold in the company at all times. It is natural that under such circumstances you will be feeling both bad as well as sad. However think of it this way that your boss who is obviously senior to you in experience and wisdom is actually so pleased with what you have done that he is actually taking credit for what work you have done. So you could consider taking it as a compliment. Here are many people who chose to ignore the matter because they are simply flattered that their boss has wanted to take praise for work which they have done. A boss who does something like this is doing nothing but acknowledging that your work has been exceptional. If you think that your own professional nature will not let you stand for such nonsense then you should immediately hand in your resignation. If your boss wants to take credit for work which you are doing so obviously means that you are exceptional at your job. It is for this reason that any company would be happy to employ you. So do not be someone who stands for such injustice, do resign and go to another company where you will receive praise for whatever work it is that you are doing. Accepting someone taking credit for your work once or twice is alright, but if it happens continuously then that is simply not fair at all. Many a times when something like this happen people have gone so far as to take legal action against the person who is guilty. This is something which obviously cannot be done in a small matter. But if the boss has taken credit for some ground breaking work which you have done in your field then you should not think twice before reputing the matter. Once you lodge your complaint and it is found to be accurate, action will immediately be taken. 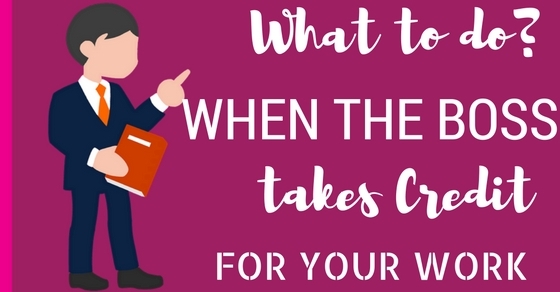 These are some of the most important things which need to be done when the boss takes credit for the work which you have done. Something like this is very common in the workplace. Rather than letting things affect you too much, you should take time out of your busy schedule to actually sit down and think about what you can do at such a time. As you notice that your boss is taking credit for work which you have done, you should immediately raise your voice in rebellion. You should not let your feelings be bottled up within you at any point in time.